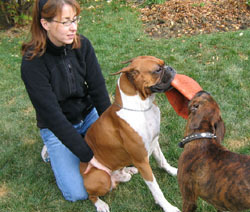 Briar posing with handler Lynn White and judge Layla Casselman. About Briar . . .
Briar is a big boy with an attitude to match. 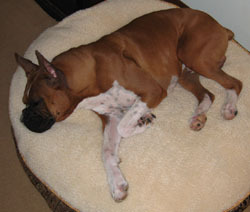 He lives with and is loved by Allan and Beverley Hegedus of Regina, Saskatchewan. 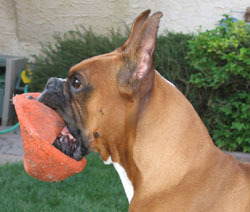 Briar is a slow maturing dog, with an incredible deep red coat, and a very striking headpiece. Briar is the first champion for his dam, Sawyer. 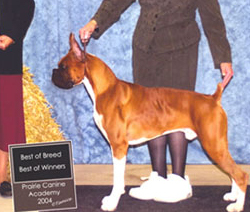 He is also the first Canadian champion for his sire, Lazer. 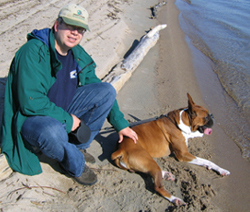 Sadly, news came on the evening of Sunday, 03 April 2011, of Briar's passing. 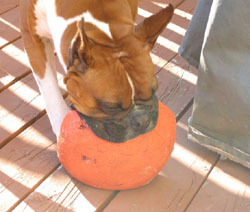 He had a great day in the back yard -- there was the hint of spring in the air and he found his favourite toy (a deflated soccer ball shown in pictures below) for the first time since the autumn when the winter snows began. Allan said it was a good day with no indication of anything being wrong until that evening. 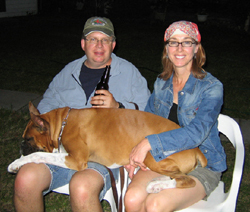 Although Briar had previously been undergoing treatment for cancer, it was his heart that failed him. 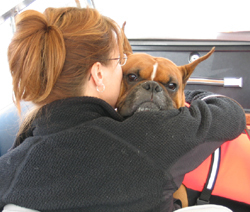 Briar had a wonderful life with a great couple that would have done anything for him. We wish it could have been longer. Rest in peace, sweet boy! Briar’s show career . . .
Briar has been shown very selectively. He would much rather bound around the show ring than behave. We are very much hoping that with maturity will also come some ring savvy. (Here's crossing our fingers.) It turns out that with some maturity, Briar did gain ring savvy and got down to business under the talent of friend and handler, Lynn White. Thank you, Lynn! 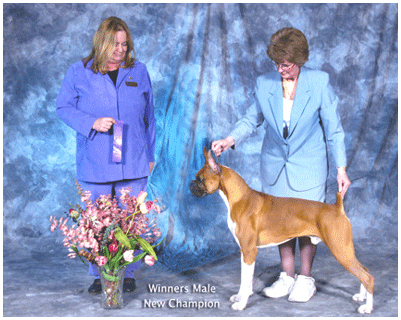 In May 2003, Briar won a best puppy in breed over a special under breeder judge, Walter Pinkser. This was Briar's first time at a dog show. 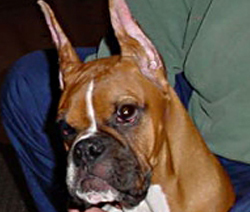 In June 2003, Briar obtained two points for winner's dog under judge, Virginia Lyne. 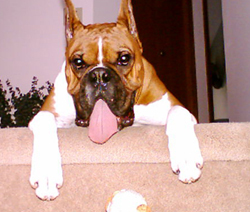 In October 2003, Briar obtained three points for best of winners under judge, Cheryl Stuber. 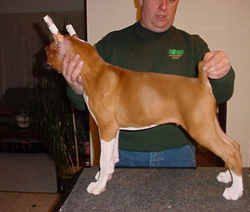 In October 2004, Briar obtained two points for best of winners and best of breed (over a male special) under judge, Pat Taylor, and the next day obtained two points for best of winners under judge, Larry Kereluke. 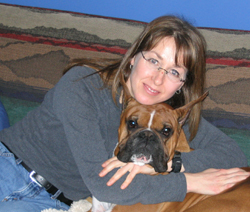 In March 2005, Briar obtained two points for winner's dog under judge Layla Casselman. This win made Briar a champion. Briar at various stages in his life . . .
Headshot of Briar at 9 weeks. Briar being stacked at 11 weeks. Headshot of Briar at 5 months. 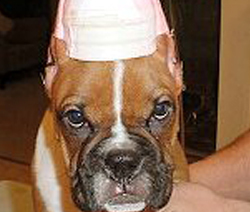 Headshot of Briar as a young adult. Briar snuggling with Beverley Hegedus. Briar still snuggling with Beverley Hegedus. 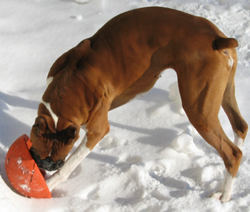 Briar playing with his favourite toy in the snow. Briar on the beach with Allan Hegedus. 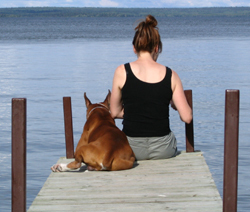 Beverley and Briar overlooking the water. 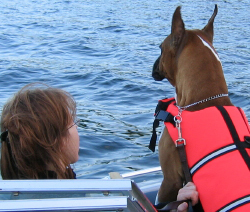 Briar daydreaming as he drifts down the lake. Briar on the dock with Beverley. Briar asleep on the couch with his best cabin pal. 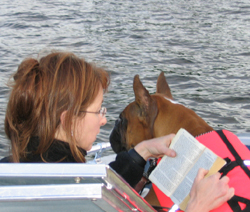 Briar keeping Beverly company as she reads a book. 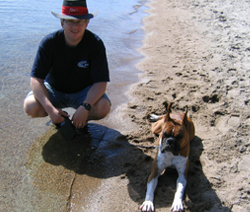 Allan and Briar taking a rest on the beach. 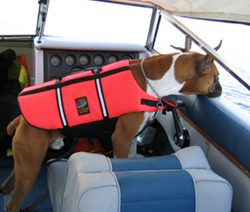 Briar in the driver's seat on the boat. 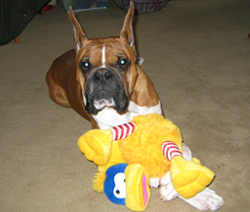 Briar posing with one of his stuffed toys. 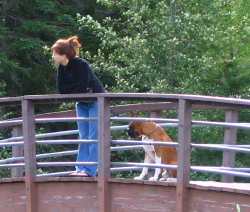 Beverley and Briar looking down from a bridge. Best of Breed for Briar under judge Pat Taylor. Briar sharing a toy with a friend. 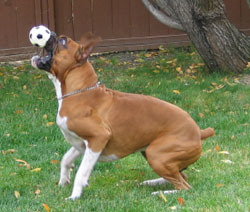 Briar in action catching a ball. 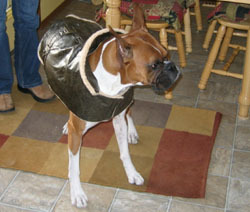 Briar sporting his new jacket. Briar taking a rare nap. Briar's favourite toy in the whole world. Briar playing on the deck. 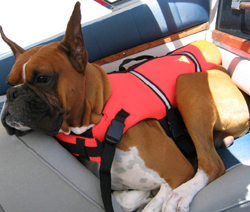 Briar loves relaxing in the sun on the boat. 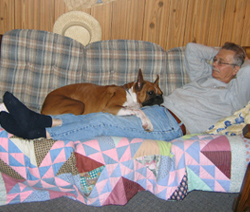 Briar always has to be close to Allan and Beverly. 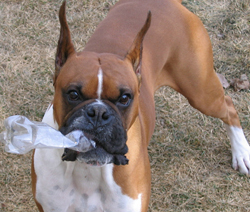 Briar playing with an empty plastic water bottle. Briar with a faceful of snow! Briar and Beverley sharing some quality time. 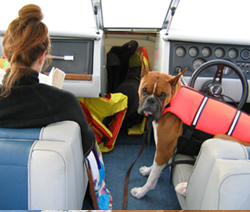 Briar playing the role of boat navigator.